Each year, the Academy of Motion Pictures Arts and Sciences nominates between five and 10 movies to compete for the Oscars’ Best Picture trophy — its most prestigious award, and the one given out at the very end of the night. What “best picture” really means is a little fuzzy, but the most accurate way of characterizing it might be that it indicates how Hollywood wants to remember the past year in film. The Best Picture winner, in other words, is the movie that represents the film industry, what it’s capable of, and how it sees itself at a specific point in time. So when we look at the nominee slate for any given year, we’re essentially looking at a list of possibilities for the way Hollywood will ultimately characterize the previous 12 months in film. And one thing that’s definitely true about the nine Best Picture nominees from 2017 is that they exhibit a lot of variety. There are genre films and art films, horror films and history films, romances and tragicomedies. And thinking about what the Academy voters — as well as audiences and critics — found enticing about them helps us better understand both Hollywood and what we were looking for at the movies more broadly this year. In the runup to the Oscars, Vox’s culture staff decided to take a look at each of the nine Best Picture nominees in turn. What made this film appealing to Academy voters? What makes it emblematic of the year? And should it win? 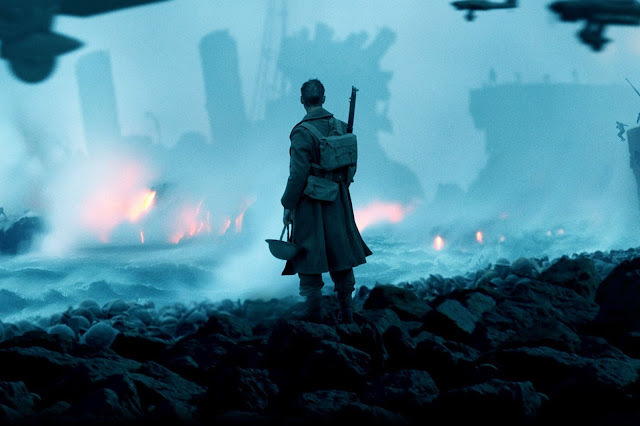 In this installment, we talk about Christopher Nolan’s Dunkirk, one of the year’s most praised films and a work of mastery that turns the idea of the war film on its head. But will all the praise for Dunkirk be enough for it to land the Oscars’ biggest prize? Alissa Wilkinson: Dunkirk hit theaters in midsummer, and while it certainly feels like the kind of movie that could be up for a Best Picture nod, it’s still a little startling to find it nestled among some of the other entries. I certainly think it was one of 2017’s best movies — emotionally resonant and technically stunning, with some unforgettable images and performances and an unusual take on typical “war movie” tropes. But because it came out long before most awards season films usually do, it easily could have gotten lost. Then again, it seemed like Dunkirk’s release was modeled on that of Saving Private Ryan, which came out during the summer of 1998 and was nominated for Best Picture in 1999. It worked: Dunkirk did great with audiences, and critics adored it, with some (including me) declaring it to be Nolan’s masterpiece. And clearly, it stuck with Oscar voters, right to the end of the year. By your estimation, what is it about Dunkirk that wooed the Academy? Why have critics and audiences alike responded so strongly to the film? What landed it on the list of Best Picture nominees? Todd VanDerWerff: On the one hand, of course Dunkirk was nominated for Best Picture. It’s a massively successful movie about World War II, and the Academy loves to nominate hits that take place at some point during World War II, even if they take place in some other part of the world entirely. On the other hand, Dunkirk is a really weird Best Picture nominee! I feel like the fact that its premise all but guaranteed that it’d be nominated — so long as Christopher Nolan had merely hit a bunt that got him to first, instead of a home run — has sort of inured us to how weird the movie truly is. It barely has a narrative, and what narrative it does have is splintered into three timelines in such audacious fashion that when those timelines converge at the movie’s end, you can’t help but be swept away. Its main character is probably the English Channel, and it’s a bit emotionally chilly, more of a triumph of construction than feeling. (This isn’t a bad thing, but it rarely wins you an Oscar. Just ask Stanley Kubrick.) The film lacks acting and writing nominations, and that sort of indifference from two of the Academy’s largest branches has been tough to overcome in the past. But on some level, Dunkirk is undeniable. Nolan has succeeded Steven Spielberg as the guy who can direct a movie about nearly anything and make it a hit, no matter how unconventional, and I don’t know anybody who doesn’t at least admire this film, outside of the handful of anti-Nolan diehards in film critic circles who roll their eyes and shake their heads at the rest of us. And, honest to God, Dunkirk still got through to some of them. Another way to explain this is that when I saw Dunkirk, I was overwhelmed by it. Its last 30 minutes or so ascend to this level of pure, operatic craft, and it left me thinking of something I read a long time ago about “pure cinema” — the idea that the movies are too indebted to theater and novels and need to break free and tell stories on their own terms. Dunkirk, for whatever faults I find in it, comes closer to that status of being this pure moviegoing experience than just about anything I’ve seen this decade. Genevieve Koski: “Pure cinema” feels like a good lens through which to view the Academy’s recognition of Dunkirk: It’s a frequently visceral experience whose impact can be largely attributed to the “elemental” components of filmmaking — visual composition, movement, the relationship between sound and image, etc. — and whose narrative eschews, to an extent, traditional expectations of storytelling elements like plot and character in favor of a structure that can’t quite be characterized as avant-garde but at least has an eye toward it. That said, Dunkirk‘s narrative structure is one of the most compelling things about the film, and — with apologies to the Dadaists of the cinéma pur movement — I’d contend that it’s essential to Dunkirk‘s “pureness,” as well as the movie’s recognition by the Academy. Let us not forget that last year’s Best Picture winner, Moonlight, was also a triptych, albeit a more traditionally chronological one, and the Academy has over the years shown a recurring interest in films that are willing to get a little adventurous in their structure — think Birdman or Slumdog Millionaire, two films I don’t like nearly as much as Dunkirk but that share its willingness to color outside the lines of traditional storytelling structure. The reason I frame this quality in terms of the “pure cinema” designation is that Dunkirk‘s structure, like those of the other films I’ve mentioned, is one that can arguably work only as a film; certainly episodic television and theater would be hard-pressed to tell this story in this way, and while you could conceivably appreciate Dunkirk‘s story written out, without the accompanying filmmaking components that make it such an immediate, visceral viewing experience, it would likely die on the page. In an entertainment era when the line between film and TV in particular feels like it’s getting ever blurrier, it makes complete sense that the Academy would want to highlight and celebrate films that highlight and celebrate filmmaking, and all the things filmmaking is capable of that other media are not. The only other Best Picture nominees that I think come close to Dunkirk in this respect are Phantom Thread and Call Me by Your Name, but those are also both operating on a much smaller, more interpersonal scale than Dunkirk. Alissa: It’s funny that you both talked about pure cinema, because though I completely agree, when I reviewed the film — and when I went back to see it again a couple of months after release, with my husband and father-in-law — I couldn’t stop thinking of it in terms of a symphony. It features tonally different movements with distinct sorts of stories (the boys on the beach, almost anonymous; the men with backstories on the boat; the lone man in the sky), and the sum of those movements is what makes the film really feel like a whole. Perhaps that’s obvious — the pieces of a movie always add up to a whole — but in Dunkirk, it’s the whole game. Two other things come to mind about Hollywood when I think about Dunkirk. The first is that it’s actually one of three recent movies that include the Dunkirk evacuation as a major part of their story. The other two are Darkest Hour, also nominated for Best Picture, and the small but lovely film Their Finest. Is this coincidence, do you think, or is it possible there’s something specific about the Dunkirk evacuation that has motivated Hollywood at this moment? And the other is the question of the cinematic experience. Lots of people were extremely eager to learn more about the various formats in which Dunkirk was screening, and I heard from many readers who went out of their way to seek out an IMAX 70mm screening — the best way to see the film, in my experience. But fundamental to that is the fact that to see the IMAX 70mm version, the best version, the version Nolan wanted you to see, you had to go to a theater and sit in a room with other people. The summer of 2017 was terrible for the box office, which suggests not very many people are doing that anymore. Do you suppose that amid a burgeoning direct-to-Netflix trend for films, it isn’t just filmmaking but the actual cinematic experience that Hollywood is interested in honoring by honoring Dunkirk? Todd: I’m all but certain that Dunkirk is earning some big brownie points for just how essential a good theater is to experiencing it at its best. (If it wins, I suspect that Nolan’s stand for the theatrical experience will be part of why.) Dunkirk is definitely improved by seeing it in the theater, though anecdotally, I’ve heard it works on phones and in the back of airplane headrests, much as my saying that might make Nolan break out in hives. My point is that a lot has been written about Dunkirk as an overwhelming triumph of filmmaking craft — look at how we just did that above! — but it ultimately works, I think, because Nolan is also a really great screenwriter. I’ll admit to sometimes finding the way he plays with time borderline gimmicky, and when I first heard about Dunkirk’s structural gambit, I groaned a little bit. But goodness was I wrong to be suspicious. Nolan is in love with stories about what it means to be a prisoner of time, to be stuck in a narrative you can’t escape. Interstellar, the movie he made immediately preceding Dunkirk (and one that was actually improved for me by watching it on television — go figure), takes that idea to its extreme, with a character living out decades in the blink of a cinematic eye, due to the effects of time dilation in space travel. Dunkirk examines the concept in miniature. What does time mean when you’re squeezed up against the shores of death, when you have one week or one day or one hour left, and that might be all you have? But a lot of Dunkirk’s excellence is due to the acting too, and I’d love to hear who your favorite performers were in an ensemble that could feel faceless. I loved Cillian Murphy, whose character arc was the movie’s best approximation of something more “traditional,” except it was told out of order, because this is a Christopher Nolan movie. Genevieve: It’s interesting that you characterize the ensemble as “faceless,” Todd, because it wasn’t until about three-quarters of the way through the film that I actually recognized one of its most recognizable faces, Tom Hardy, who’s buried under a fighter pilot helmet for most of his time onscreen. (This is doubly embarrassing given the number of times Nolan and Hardy have worked together in the past.) But it’s the first face we see in Dunkirk, that of the British private Tommy — played by the heretofore-unknown Fionn Whitehead — that always pops into my head when I think of this film. Tommy’s mad dash through the streets of Dunkirk for the relative (very relative) safety of the beach where troops are waiting to be evacuated is a pure shot of adrenaline, and while a good portion of that is attributable to the filmmaking of the opening sequence, Whitehead provides focus amid the chaos. This is not an uncommon tactic in war films, giving viewers an individual human reference point or two to latch onto among seas of faceless troops, but Whitehead evokes such naked vulnerability and fear in such a short amount of time, establishing the emotional as well as physical stakes facing the troops on that beach with little more than a series of increasingly panicked looks. Whitehead may not have the immediate name or face recognition of a Tom Hardy (minus the helmet) or Cillian Murphy or Kenneth Branagh, but it’s that very lack of previous associations that makes him feel so emblematic of this film in particular. Alissa: So, given everything we’ve said — in five or 10 years, what idea, image, or scene will stick with you? What will you think of when someone mentions Dunkirk? Todd: For me, the first thing that came to mind was just the ocean, the way it stops the characters from going where they need to go, the way it almost becomes a villain simply by its existence. This is a cold and wet movie, and especially in 70mm, on an IMAX screen, those waves seem to stretch on forever. Genevieve: I’ve already mentioned Whitehead’s panicked skyward glances, but I think what I’ll remember most about Dunkirk is the conversation it engendered about the necessity of appreciating it on the biggest screen available, accompanied by the best sound possible — and my shame over the fact that that’s not how I saw the film, which I watched for the first time months after its release on a screener. But you know what? It was still a damn great film when viewed on my regular ol’ television set, which feels like confirmation of the idea that while the “pure” filmmaking on display is generally the most celebrated aspect of Dunkirk — for good reason — it’s not all this movie is. Alissa: When I think of Dunkirk, I think of its final scenes, after the young men have been evacuated and returned home, and we get the distinct sense that they are overwhelmed with shame. They’ve survived, but they don’t yet know whether their homeland will exist for much longer. There’s one moment where a young soldier encounters a blind man handing out blankets, who tells him that it’s enough that they made it back at all. And I think that’s what stirs me still about Dunkirk: It’s not a movie about triumph, but about many people in the face of uncertainty trying to find their way forward in the darkness. To be perfectly honest, that’s what made this film, perhaps uniquely among the others, something I really needed to see in 2017.